Hard physical work and overexertion of the muscles cause damage and pain. Muscles need to develop gradually so that they can grow as they are used on a regular basis. If they are used beyond their capacity, pain will result. 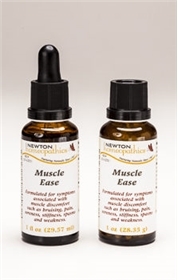 To relieve muscle tension and soreness due to stress, overexertion, body adjustments, massage, and hard physical workouts, take Muscle Ease. Directions: For mild symptoms take 3 to 6 drops on the tongue once or twice a day. For severe symptoms take a dose every 15 minutes until symptoms abate. In cases of more severe pain or systemic overexertion, physical workouts, or bruising, take Aches & Pains complex to assist the body in a quicker recovery. Aches & Pains complex is also helpful for pains that come and go, such as rheumatic pain, or general body pains. For bruising, a topical application of Arnica Tincture or Arnica Ointment is also helpful. If the muscle pain is specific to leg cramps, use Leg Cramps. Ingredients: Antimonium tartaricum, Arnica montana, Bryonia alba, Chamomilla, Eupatorium perfoliatum, Hypericum perforatum, Rhus toxicodendron, Ruta graveolens, Stramonium, Strychninum 15x. Chamomilla, Chelidonium majus, Cimicifuga racemosa (Actea racemosa), Phytolacca decandra, Ruta graveolens, Symphytum officinale 3x. Alcohol 20%.